Over the past forty years, jewelry making has become increasingly rich and diversified as the time-honored reliance on precious metals and gems has been augmented or even disavowed. After the Second World War, jewelry artists more and more turned to intellectual and artistic concepts as their starting points to provoke a reexamination of the role of jewelry itself as well as of the relationships between maker and wearer. Jewelry artists in northern Europe and the United States led the way, and in Germany, Hermann Junger (b. 1928) exerted a strong influence on the development of contemporary jewelry both as an artist and mentor. As one of Germany’s premier goldsmiths, Junger’s innovative jewelry and inspired teaching had a far-reaching influence not only in his native country, but throughout Europe and the United States as well. A technically accomplished goldsmith trained in the German tradition, Junger deliberately violated accepted practice in order to permit a broader scope of the goldsmith’s art and so opened new avenues for successive generations of jewelry artists. His primary interest was to change the focus of German goldsmiths from merely producing smooth surfaces and precision settings to taking a fuller part in creating their own designs. Even though he was technically proficient, Junger developed a style that underscored his departure from standard practices by taking artistic license and even delighting in imperfections and a degree of randomness in composition. Junger concentrated on the “act of making” because he felt it was a crucial part of a wider human experience and one that was becoming increasingly rare. The analogy that illustrates Junger’s alternative concept is that of the contrast between a well-groomed and tended garden and the effusive energy and unrestrained natural beauty of wild flowers in a meadow. Hermann Junger, the oldest of three children, was born and grew up in the German city of Hanau , near Frankfurt , known as the “Town of Noble Jewelry ” for its long-standing tradition of gold- and silversmithing. Such traditions were promoted in the 1930s as part of the nationalistic glorification of “Family, Blood, Country, and Craft” so that every artistic event or exhibition in Hanau reflected the presence of the goldsmith’s tradition. As a result, as a young boy he considered goldsmithing as simply another word for “art” and a goldsmith as one who, first and foremost, draws or sculpts. Junger states that he quite naturally identified his interest in drawing with the craft of goldsmithing but did not fully appreciate the goldsmith’s long and technically demanding practical training. Junger’s determination to realize his artistic ambitions through a craft medium would not only affect his own career, but also influence the course of contemporary studio jewelry in the postwar era. In 1947, at the age of nineteen, Junger enrolled in the Staatliche Zeichenakademie ( State Drawing Academy ) in Hanau , founded in 1772 to provide training for gold- and silversmiths with an emphasis on design and the understanding that this training would have to be followed with practical apprenticeships. At the time of Junger’s attendance, the drawing academy had just resumed classes in the cellar of a bombed house, with courses that concentrated almost entirely on drawing, painting, and sculpture, since most of the metalsmithing tools had disappeared during the war and there was no appropriate metal available. As a result, Junger learned to realize his designs through pen-and-ink drawings that would subsequently serve as guides for his metalwork, a practice he has maintained throughout his career, later extending it to include watercolors. In 1953 Junger began studying at the Munich academy with Franz Rickert (1904-1991), one of Germany ‘s most important gold- and silversmiths. A philosopher, educator, and craftman, Rickert had played a major role in bringing the new academy into existence, thereby directly contributing to making Munich into a major center for contemporary metalwork. As director of the goldsmith program at the Munich academy, Rickert left his mark not only on Junger but on more than 150 goldsmiths and silversmiths, many of whom later achieved international status. As a result, Rickert’s teaching eventually was to exert a more profound impact than did his considerable output of objects in silver and nonferrous metals, which included everyday utensils and liturgical instruments in addition to jewelry. Rickert’s encouragement of his students’ individualism and their experiments to find their own expression heralded changes in the attitude of the jewelry community regarding the nature of the goldsmith and his work. His prominence as an expert German craftsman lent legitimacy to the new direction undertaken by younger artists such as Junger. Seeking historical parallels for his belief that there was more to creating objects than mere manual dexterity and technical know–how, Junger searched for texts on the goldsmith’s art. For example, he discovered the Schedula Diversarium Artium, written by the twelfth-century monk Theophilus Presbyter on goldsmiths of the Middle Ages, taking note that during that time there were no distinctions drawn between artists and craftsmen. Junger also used Presbyter to expand his practical knowledge through the chapters that covered virtually all the techniques of the goldsmith such as gilding, soldering, gem setting, niello work, repoussé with precise instructions and processes that he found still perfectly valid. r In the writings of the Italian Renaissance goldsmith Benvenuto Cellini (1500-1571), Junger also found support for Rickert’s argument that “the strength of the old craftsmen lay primarily in the lack of division between their “thinking” and “doing,” [and that] all the objects made by their hands, both technical and artistic, seem as if evolved by natural growth.â  Junger, like Rickert before him, may well have been reacting against the marginalized role of the craftsman and the handmade object amid Germany ‘s emphasis on mass production for the consumer society created by the postwar Wirtschaftswunder (economic miracle). Junger, as an artist-craftsman, focused on the act of making as a means of promoting diversity, individuality, thought, and skill. Through his jewelry, Junger found meaningful ways to reconnect making with thinking, replacing the anonymity of the mass-produced product with the mark of the craftsman’s own hand and so forging a more human link between the wearer and maker. As Junger’s skill as a goldsmith continued to grow, he became increasingly confident in his ability to fulfill his artistic intent. 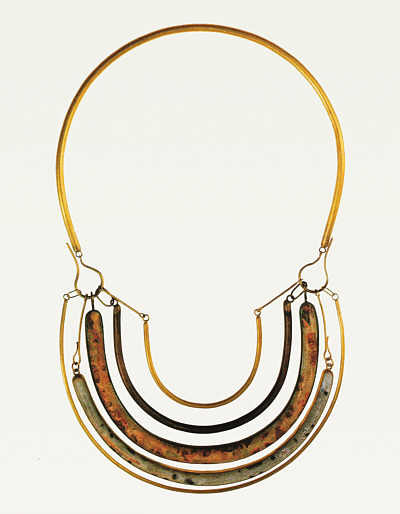 A 1957 necklace is a typical early work that reflects Junger’s effort to restore the spirituality of the goldsmith’s craft be rejecting the “frozen perfection” of highly finished objects. Even though Junger considered that he had to work against the rules in order to create his art, he was always mindful that jewelry was not abstract sculpture but meant to be worn. Using rich materials high-carat gold in combination with gemstones Junger positioned the individual moonstones, rubies, and sapphires on the roughly finished necklace pendant as if they were elements from a painter’s palette. Junger states, “These [gems] are not colors one can deliberately change or mix [as a painter would], but they exist as they are. The palette is limited but, at the same time, open to endless combinations, provided one does not allow their commercial value to hinder an uninhibited choice .”  In grouping his colorful assortment of semiprecious stones, Junger sought to achieve an artistic appeal that he found more valuable than the “commercial value of the gems [through] their high-polish, weight, and flawlessness ”  In addition to the use of gems for random color variations, the necklace exemplifies Junger’s painterly manner with chased lines, dots, and dashes that are reminiscent of his drawings. On this necklace, as on all subsequent pieces, Junger left his hallmark, a raised bird, as a compositional element and personal signature. When Junger’s work was shown for the first time in the Munich Handswerkskammer in 1960, it caused considerable controversy among the traditional goldsmith community. Some of his colleagues accused him of mocking the goldsmith’s art, taking too many liberties with his treatment of materials, and of allowing craftsmanship to disappear. 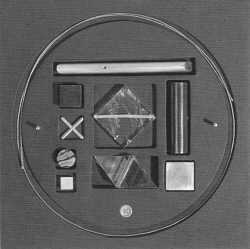 They pointed to the fact that soldered seams were left visible, that irregularities in the metal were allowed to remain, and that stones appeared to be haphazardly grouped. Junger still gratefully remembers the support he received from Walter Mersman (1901-1973), a well-known sculptor and jeweler working in Worpswerde, an artists’ colony in northern Germany , who understood and respected the new aesthetic and formal potential of Junger’s work. Mersman compared the energy and beauty of Junger’s jewelry to that of a wild meadow, arguing that it be respected just as much as “the carefully manicured English lawn.”  Bearing the “meadow” analogy in mind, one can quite vividly relate its riotous growth of dandelions, thistles, and other flowers to Junger’s brightly colored enamels and precious stones and to his profusion of forms long and short, sleek and gnarled, smooth and wrinkled. Concurrently with his wider acceptance in German, Junger enjoyed a growing international recognition. He also became a persuasive writer on the nature of making, and his published articles increased his influence and placed contemporary jewelry on a firmer footing. Junger’s work was increasingly exhibited outside of Germany , and his work and ideas were disseminated through a full travel and lecture schedule that included Japan , Australia , South Africa , and the United States . At the invitation of Robert Ebendorf in December 1982, more than 450 jewelers, goldsmiths, professors, and collectors gathered on the campus of the State University of New York, New Paltz, to view the first American exhibition of Junger’s work and to hear him speak. Titled “1 + 8,” the exhibition included works be Junger and eight of his students. Junger designed special cases to display his own works, many of which were presented in intriguing relationships with his drawings. Characteristically, the drawings were punctuated with brief, almost calligraphic notations and words such as “Email,” “Tombak,” or “Gold,” serving as signposts leading to his finished works. Junger’s early works also included a series of intricate pendants and necklaces that derive their vitality from ancient tribal and ritualistic artifacts. He thus followed the path of such prominent twentieth-century artists as Pablo Picasso, Max Ernst, and those of Die Brucke (the Bridge) and the Blanc Reiter (Blue Rider) groups who also invigorated their work with the raw energy of tribal imagery and ancient ritualistic devices. The use of fetish objects of tribal peoples as artistic source material represented new ground for the German goldsmith, and Junger has made use of them throughout his career to combat intellectualization in his work. Junger asserted that while some jewelry needed great refinement and precision to exist, there was another category of jewelry, one that he preferred, whose life was derived from its raw energy and its very lack of perfection. One of the major challenges facing the new generation of postwar jewelry artists was to sustain the spontaneity of artistic inspiration in spite of the time-consuming process of goldsmithing. In this regard, Junger became a skilled craftsman capable of translating the freedom and emotion of his drawings into jewelry with great fluidity. It is ironic that Junger needed the precision and craftsmanship of the traditional goldsmith to realize his fluid imagery in metal. When one looks at his drawings and the jewelry side by side, it is apparent how faithfully he captured the lightness and animation of his penstrokes despite the difficulty of translating the ethereal qualities of his unusual forms into metal. His drawing style is fluid and has a rhythmic flow as does his handwriting. Although Junger’s work owes little to the influence of other contemporary jewelers, he acknowledges the significant impact of the German painter Julius Bissier (1893-1965). In a 1984 interview, Junger explained that Bissier’s watercolors had a special fluidity that he wished to convey in his own work. 18 Many of Bissier’s intimate paintings contain abstract forms that seem to float weightlessly in their own world, a quality that is captured in many of Junger’s drawings and watercolors. While they are exquisite works of art that can stand on their own, Junger’s drawings also function much as blueprints, often containing technical instructions on materials, fastenings, and hove to assemble the various small sections into the larger composition. Starting in the 1960s, Junger extended his experiments to explorations of a wider range of materials, notably enamels, that he used both as ornament and base material. 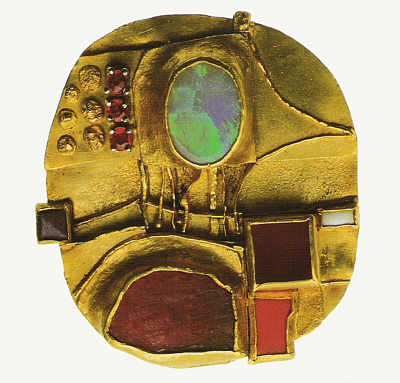 Examples include brooches and pendants with more compact pictorial compositions that reflect less of the Romanesque influence than did the loosely connected individual elements of his earlier work. He also replaced individually set stones with ridges and protuberances that were raised from the primary metal, frequently capping them with colorful enamels to create miniature topographic landscapes. One of the inspirations Junger mentions for this period is the Dusseldorf painter Peter Bruning (1929-1970), who was popular in Germany in the 1960s. The gestural character of his work expressed through a tangle of brushstrokes cascading over a tonal background resemble the abstracted patterns in Junger’s drawings and his jewelry. In 1968, after making jewelry for more than ten years, Junger was awarded the prestigious Ehrenring der Gesellschaft fur Goldschmiedekunst (Prize Ring of the Society for Goldsmith Art). Barely forty years old, Junger was one of the youngest prizewinners, and the award was a vote of recognition and appreciation from his older colleagues in Germany. At the award ceremony, Dr. Ulla Stover, director of the society at that time, wrote, “[Junger’s] work unites sculptural, graphic and colorful elements, bringing design and craftsmanship in contact with the work of nature herself.”  This and other votes of confidence heralded the fact that older German goldsmiths acknowledged Junger’s role as a leader in the new direction in German goldsmithing. In the late 1970s, Junger began to use nonprecious metals regularly, especially tombak, which, like bronze, is an alloy of copper and zinc. These works offered a visually new and exciting alternative to precious materials as Junger expanded his palette to include unusual combinations of materials–rusty surfaces, grommets, wires, rods, tool-punched tin, coral branches, bits of hematite and blood jasper, and even Plexiglas. 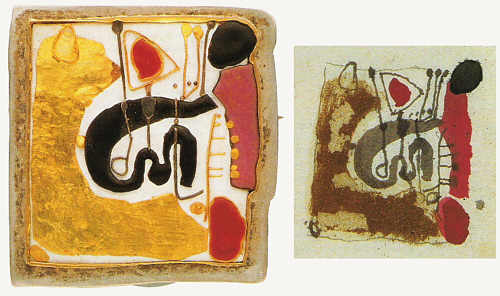 To capture a sense of the unexpected in other works of that period, Junger created brooches and pendants by soldering a sheet of tombak to one of silver; he then punched the combined sheet from the back and filed ins away the protrusions on the top sheet to reveal the contrasting metal underneath to create a series of brushstroke-like patterns. Junger also continued to draw inspiration from a wide range of artifacts from non-Western cultures. As a result, Junger w as one of the first to use the boomerang shape as a prominent motif in jewelry. In 1952 he visited Australia and gained a firsthand appreciation for the directness and vitality of Aboriginal objects and decoration. 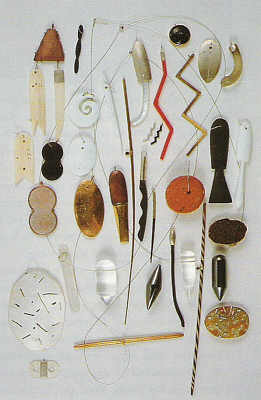 In the late 1980s, Junger created a series of necklaces with interchangeable parts that allowed the wearer to configure the components as desired. The elements included squares, cylinders, and other geometric shapes in ivory, enamel, gold, and silver as well as both precious and semiprecious materials. With these carious components, the wearer can create an ever-changing personal statement. In later works, whenever the piece is not being worn, it is designed to be disassembled into a specially built matte-black container recalling the compact and anonymous “black box” look from German industrial design. The box makes an arresting contrast to its contents of individually crafted elements, as in his 1987 example, where there is an almost mathematical layout in which the interchangeable pendants are housed in recessed areas surrounded by the thin wire on which they are to be worn. In his recent works, Junger’s jewelry forms have been variations on themes that have occupied him time and again. 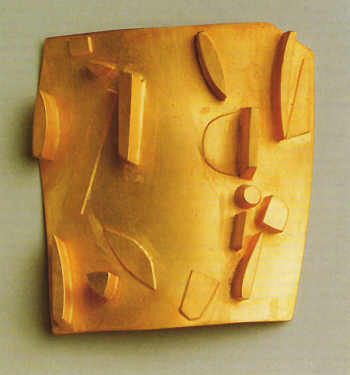 A 1994 Brooch in pure gold, for example, creates variation and interest through raised surfaces that resemble a desert landscape. There is a clear relationship between this recent work and Junger’s earliest work– the irregular rectangular shapes, the raised elements and their seemingly haphazard placement. In many recent works, however, the brilliantly colored gemstones and enamels are replaced by more muted tones, often creating the impression of an abstract landscape that is seen from a bird’s-eye view and informed by the natural world rather than Romanesque jewelry. Hermann Junger, Vom Schmuck and Uber das Machen: Neue Goldschmiedearbeiten (About Jewelry and Making Things) (Munich: Galerie fur angewandte Kunst, Bayerischer Kunstgewerbe-Verein , 1996), p. 7. The director of the school was the well-known gold-and silversmith Hugo Loven. Conrad Gertenbach and August Bock instructed Junger in drawing and model making. Junger personal communication, August 1999. Hermann Junger, 1979, quoted in “A Goldsmith’s World,” Art Aurea, 1/89, p.58. During this period, he designed several prototypes for Rosenthal, as noted in Helmut Bauer, Munchner Goldschmiede: Schmuck und Gerat der Gegenwart (exh. cat.) (Munich: Stadt Museum, 1993), p. 200. As described in Hermann Junger, âThe Goldsmithing Class at the Munich Academy of Creative Art,â Art Aurea, 1/87, p.43. Rickert trained under the painter and goldsmith Adolf von Mayrhofers at the Munich State Academy for Applied Arts. He became a master of gold- and silversmithing in 1931 and was made professor at the Academy for Applied Arts in 1935. As quoted in Hermann Junger, Vom Schmuck and Uber das Machen. p. 61. As quoted in Hermann Junger, Vom Schmuck und Uber das Machen, p.59. In discussing the process of “making,” Junger also credits the influence of Wilhelm Braun-Feldweg’s 1950 book Metall: Werkformen und Arbeitsweisen (Metal: Design and Working Processes). Personal communication (by telephone), November 1999. Hermann Junger, Vom Schmuck and Uber das Machen, p. 137. 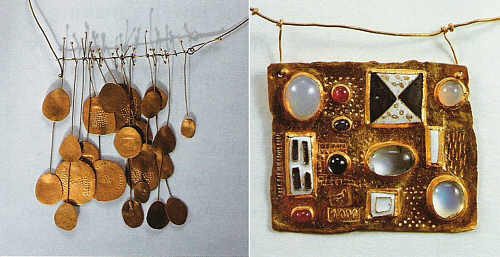 Rudiger Joppien, 1989, “Der Kosmos eines Goldschmieds” (A Goldsmith’s World), Art Aurea, 1/89, p. 56. As quoted in Rudiger Joppien, op. cit. Junger primarily used pen and ink in the 1950s and 1960s, and later produced delicate watercolor studies on crumpled packing paper or chalk and watercolor on irregularly torn-outs sheets. Julius Bissier was born in Freiburgim Breisgau, studied art history at Freiburg University (1913-14) and briefly attended the Karlsruhe Academy before serving in World War I. His first painted compositions were inspired by German Expressionism. Bissier turned to abstract art in 1929 and developed a close friendship with Oskar Schlemmer. After World War II he made color monotypes, wood engravings, and india ink drawings. In 1955 he began to make “miniaturesâ in oil tempera and watercolor. Rudiger Joppien, “Halsschmuck und Broschen-Anmerkungen zu Arbeiten Hermann Jungers,” in Hermann Junger Schmuck nach 1945, (Nurnberg: Germanisches Nationalmuseum, 1988), p.17. Personal communication by telephone, November 1999. Personal communication, August 1999. Bruning was one of a group of German painters associated with Art Informel that bore a close relationship to Abstract Expressionism. Bruning worked with the canvas an the floor, painting swiftly and spontaneously to a freely expressive manner. As quoted in Rudiger Joppien, p. 57. As quoted in Lisa Spiros, âHermann Junger: From the Mind to the Making,” Metalsmith, Fall 1990, p.32. The boxes are composed of fine, particle-resin board that are machine-routed by computer to give them an industrial appearance. Ursula llse Neuman is a curator at the American Craft Museum, New York.